This is a continuation from last week's post about Distributed Generation for Energy Beyond the Grid. The problem with REAP and many renewable policies, says Bob, is that they are piecemeal by state and uniformly difficult to access. “A complaint that we hear over and over from people trying to increase their energy security is that they can’t move forward, either because of the agency, the layers of review, or the time it takes to get an answer on an application. Moreover, people in the renewables industry want a national energy strategy. Why? It’s the same mantra we hear from businesses of all types: certainty. A uniform national policy and incentives would help businesses to plan long-term. 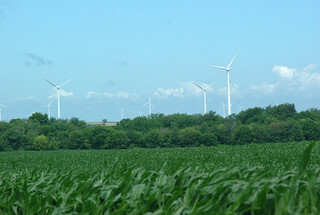 Even with federal incentives for renewables, someone contemplating investing in a 60-turbine wind farm is looking at a nearly quarter-billion dollar investment. “Certainty about nationwide incentives and national renewable standards would make people more comfortable with those upfront investments,” says Bob. Unfortunately, this is not as easy for the little guy. Federal law allows PACE, or Property Assessed Clean Energy, financing as an option for commercial, industrial, and agricultural property owners. PACE eases the pain of a large upfront investment by allowing owners to borrow the funds necessary to install renewable improvements, then pay the loan back through an assessment on their property over a period of years. However PACE financing is up to local city governments. Right now, for example, not one community in Illinois offers it! Next week our series interviewing Bob Belick concludes with his thoughts on our upcoming "decade of decision." I knew I shouldn't have opened this one after 10 pm. Oh! the webs that are woven. g'night.